Fresh sweet corn is boiled along with edamame. Both of them are then mixed with onion and seasonings. 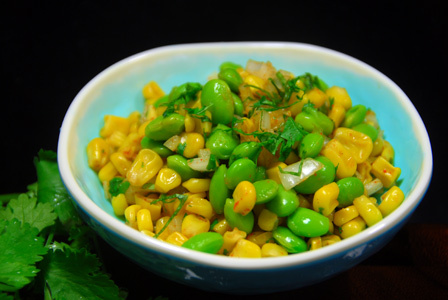 Serve corn edamame chaat immediately when it is still warm. Makes: around 2 Servings of Corn Edamame Chaat. Separate leaves, wash and finely chop the cilantro. Boil the edamame till just soft. Serve corn edamame chaat immediately. Notes: Make sure corn and edamame are cooked right. Suggestions: Adjust seasonings according to your preference. Variations: Check other recipes with corn here. Other Names: Corn Edamame Chaat. Tomato gravy is prepared by first blanching the tomatoes to easily peel off the skin. The peeled tomatoes are then crushed and made into gravy with onion and spices. Firm tofu is cubed and added to the tomato gravy as a last step. Tofu can also be deep fried in oil till golden brown if desired. 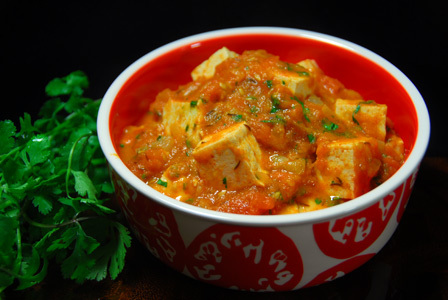 Makes: around 4 Servings of Tofu in Tomato Gravy. Chop the tofu into small half inch cubes and keep aside. Wash and make cross slits in each tomato. Bring to boil few cups of water, add the tomato and boil for couple of minutes to loosen the skin. Strain the tomatoes, peel the skin off and crush the peeled tomatoes. Heat oil in a pan, add caraway seeds. Once the seeds start to sizzle, add the chopped onion. Fry till onion turns translucent, stir in crushed tomato. Cook on medium flame till tomato is completely cooked and the gravy becomes a little thicker. Stir in red chili powder, coriander powder, garam masala (if using) and salt. Add the cubed tofu and simmer for a minute. Notes: Make sure not to overcook once the tofu is added. Suggestions: Make sure not to overcook the tomato gravy that its too thick. Variations: Check scrambled tofu here. Other Names: Tofu in Tomato Gravy. Edamame are fresh soybeans in a pod. The soybean pods are boiled in salted water till just soft and shelled. Tomato, onion, bell pepper are finely chopped and mixed with the boiled edamame along with spices and herbs. Serve edamame salad immediately. Makes: around 4 Servings of Edamame Salad. Boil the shelled soy beans in enough salted water for around 10 minutes or until they are soft. Strain the boiled soy beans and refresh in cold water and keep aside. Wash, deseed and finely chop the tomato. Wash, remove stem, discard seeds and finely chop the bell pepper. 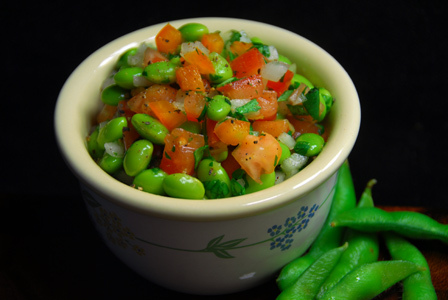 In a mixing bowl, mix together boiled and shelled edamame, chopped onion, tomato, bell pepper and cilantro. Stir in pepper powder, salt and lemon juice. Notes: Make sure edamame is boiled well before removing from heat. Suggestions: Adjust spice with black pepper. For extra spice, add finely chopped green chile. Variations: Check other versions with edamame here. Fresh ripe papaya is peeled and chopped. It is then smoothly blended with soy milk. Honey or sugar is used to sweeten the smoothie. Serve papaya soy smoothie immediately or chilled. Makes: around 2 Servings of Papaya Soy Smoothie. Peel and chop papaya into cubes (around 2 Cups). Finely chop couple of cubes of papaya for garnish. Roughly chop the peeled banana. 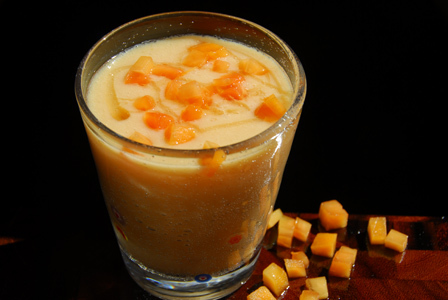 Blend together papaya, banana, cold soy milk and honey smoothly using a blender. Pour the papaya smoothie onto serving glasses. Garnish with chopped papaya and honey. Notes: Adjust the consistency of the papaya milkshake with water or soy milk. Suggestions: Chill the papaya if desired or used crushed ice while blending. Variations: You can flavor the smoothie with a pinch of green cardamom powder. Other Names: Papaya Soy Smoothie. Menthi Kura Meal Maker Kura. Soya granules are soaked with hot water till soft. Feungreek leaves are fried in tempered oil along with green chiles. Soya granules are then added to the fenugreek leaves along with other spices. 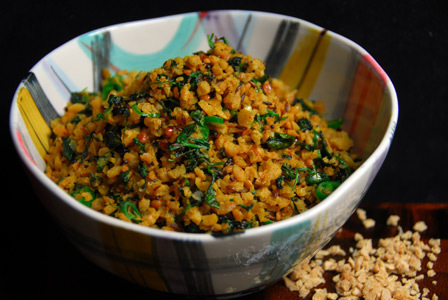 Serve soya granules with fenugreek leaves with plain non fat yogurt or with steamed rice. Makes: around 3 Services of Soya Granules with Fenugreek Leaves. Soak soya granules in hot water for around 5 minutes. Strain the soya granules and keep aside. Wash thoroughly and finely chop fenugreek leaves discarding thick stalks. When mustard seeds start spluttering, add green chiles, and fenugreek leaves. Fry till fenugreek leaves wilt and start to crisp up. Now add strained soya granules and mix well. Cook covered for a minute and uncover. Stir in turmeric powder, red chile powder and salt. Mix thoroughly and remove from heat and add the lemon juice. Notes: Make sure soya granules are not over soaked. Suggestions: If soya granules are over soaked, strain and spread the granules on kitchen towel for sometime before adding to the curry. Variations: You can also add ginger garlic paste and garam masala to the dish if you wish. Other Names: Soya Granules with Fenugreek Leaves.